All dogs love bones! 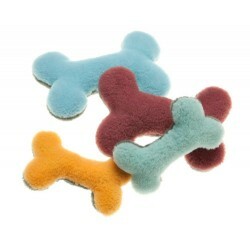 This plush eco friendly bone will be a special favorite. It's great for you.. Your cat is sure to adore this cute flower cat toy. It is made with friendly fabric that utilizes 8..
Tux is a durable and strong play toy that you can stuff with your dog's favorite treat for tons .. The Tizzi is a fun and energetic dog toy that is buikt to last. It's super durable and your dog ..